Are you looking for some fun as the summer comes to a close? 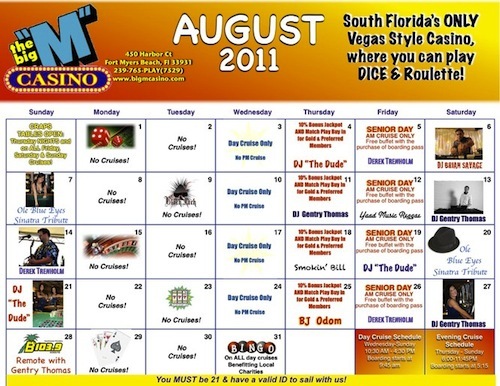 Check out all the specials the Fort Myers Beach Big “M” Casino Cruise is offering this month. Play craps– tables are open on Thursday nights and on all Friday, Saturday and Sunday cruises. Join the player’s club and earn points for cash back! Slot players earn cash rewards for playing. Contact the Big “M” Casino Florida’s only Vegas style casino games where you can play craps, roulette, blackjack and make your reservations today!